Preston Street Primary School pupils, Councillor Kate Campbell and Digital Scotland's Stephen Chambers in Newington. More than 2,400 homes and businesses in Newington are now able to connect to high-speed fibre broadband thanks to the £428M Digital Scotland Superfast Broadband programme. 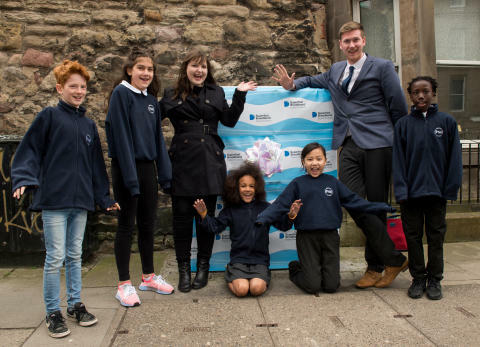 The Digital Scotland team celebrated fibre availability in the Edinburgh district this week as they visited a fibre street cabinet that serves part of the local area. They were joined by senior pupils from Preston Street Primary School and Councillor Kate Campbell. The Newington premises are among around 890,000 homes and businesses across Scotland which are now able to access fibre broadband through Digital Scotland rollout. The programme announced last week that more than 95 per cent of homes and businesses across Scotland can now access fibre broadband. Combined with commercial coverage, the DSSB programme exceeded its target of 95 per cent on schedule. Other areas in Edinburgh to benefit from the Digital Scotland rollout, led by the Scottish Government, include parts of Balerno, Lothianburn, Inverleith, Portobello, and Newhaven. More local coverage will follow as engineers from Openreach – Scotland’s digital network business – continue work on the ground. Fibre broadband offers fast and reliable broadband connections at speeds of up to 80Mbps1 and there are many suppliers in the marketplace to choose from. Whether you own a business, work from home or want to keep in touch with friends and family, fibre broadband enables multiple users to connect to the internet at high speeds and get better, faster access to online services. Sara Budge, Programme Director for Digital Scotland Superfast Broadband, said: “It’s fantastic news that the programme has been able to benefit residents and businesses in and around Newington. Digital Scotland funding partners include the Scottish Government, Highlands and Islands Enterprise, BT Group, the UK Government through Broadband Delivery UK (BDUK), local authorities and the European Regional Development Fund. BT Group is investing £126 million in the rollout, and the total project value includes around £18 million which is being reinvested back in to the programme as a result of stronger than expected take-up. Robert Thorburn, Openreach fibre partnership director for Scotland, said: “Thousands of people and businesses across Edinburgh now have the opportunity to access their best-ever broadband speeds when they sign up with a service provider. 1These are the top wholesale speeds available over Fibre-to-the-Cabinet (FTTC) technology from Openreach to all service providers; speeds offered by service providers may vary. 2For further information see the Ofcom Connected Nations report 2017.